In early November 2017 – just six months ago – I went to the Irrawaddy Writers Festival in Mandalay, Myanmar. And got castigated for swanning around in Burma when the country was guilty of war crimes, genocide in the Rakhine region, chasing half a million of their Rohingya citizens into neighbouring Bangladesh. It’s curious, I thought, that I used to get swatted for visiting Burma and therefore not supporting Aung San Suu Kyi. Now I was being whacked for visiting Burma and thereby supporting Aung San Suu Kyi. In fact much of the festival was spent debating what the hell was going on and why the whole nation – top to bottom – seemed to be in a state of denial about the whole thing. Undoubtedly helped by that great propagator of the views you want to hold, Facebook. If Facebook were to toss in a billion dollars (or better yet several billion dollars) to support the refugees in Bangladesh it might go a teeny tiny step to righting the damage they’ve done. I mused some more about the Rohingya situation a month later. ▲ Refugee settlement outside Kutupalong, since 2005 the centre for refugees from Myanmar. 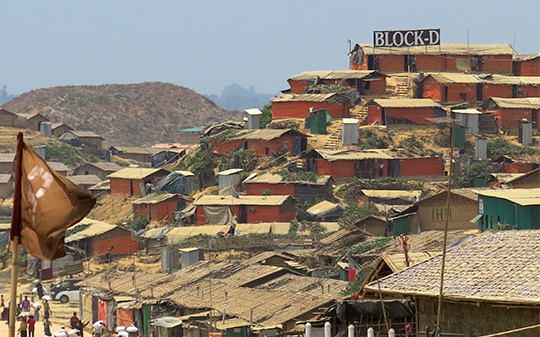 So it seemed altogether appropriate to have a look at the other side of the situation, the Rohingya refugee settlements in Bangladesh. 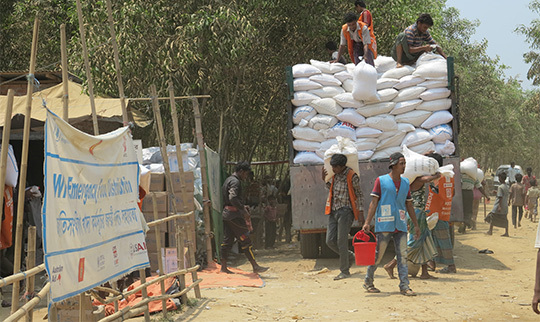 I flew to Dhaka, the capital of Bangladesh, continued on to Cox’s Bazar (with its 125km long beach and countless Bangladeshi tourists) and then went down to the settlements around Kutupalong. This has been the centre for refugees from Myanmar for over a decade, but kicked into a higher gear after 2015, when the Myanmar genocide (there’s no other word for it) kicked into a higher gear and then expanded at the speed of light after August 2017 when the Myanmar army was really unleashed upon the Rohingya people. The camps must spread over an area more than 50 times greater than the original UN camp. I travelled around the camps with Linda Fox and Anna Demant from my own Planet Wheeler Foundation and with John Littleton of Children on the Edge (COTE) who work to provide education for, well for children who are indeed on the edge. COTE was originally set up by Anita Roddick who founded The Body Shop. ▲ Now what can you do for a half a million hapless refugees who suddenly flood into your already poor and overcrowded country? Well you can feed them and the UN and many other agencies certainly seem to be doing that. We encountered food dispensing operations everywhere we went and saw an awful lot of people trudging back up the hills with sacks of rice on their shoulders. ▲ You can house them and a great deal of effort is going into putting some sort of roof over a half a million heads. ‘Eve,’ whose Bangladeshi philanthropic organization had raced in to the situation, took us around her Amal Model Village which she had helped fund. The view is across the valley from that village to more refugees on the next ridge line, the monsoon was about to hit and when the rain comes down you need to be at the top of the hill, not the bottom. Note the orange outhouses below the ridge line and no, the refugees, have not been busy growing rice since they arrived last August. The rice paddies will be the work of local Bangladeshis who suddenly have a half million extra residents encamped around them. ▲ Amazingly the roofs over their heads should not be too substantial, build something out of bricks and it indicates you’re planning to be there for the long term. These are temporary refugees who, no doubt, will be repatriated to Myanmar ASAP. As if! So mud, bamboo and plastic sheeting are the approved building materials. Toilets – latrines – are vitally necessary as well and these concrete rings were everywhere, a latrine could be 3, 6, even 12 rings deep. We met a Bangladeshi entrepreneur who’d shifted down here from Dhaka because of the latrine-building business opportunity. ▲ Education is also vitally necessary, just because these kids are refugees should they be cut off from learning? Education – and particularly for girls – is the big factor in any hope for our world today. I went to a talk on Iran recently where it was pointed out that (despite all Trump’s dislike for the place) since the Islamic revolution the number of children per mother in Iran had dropped from around 8 to a similar story to a number of advanced western countries, ie replacement numbers, which is 2.3. One of the complaints in Myanmar was ‘they’re outbreeding us’, they all have 8 children. Sadly from the small sample of families I spoke with in the camps, they did indeed seem to have a lot of children. That isn’t going to be fixed without education so I’m enormously pleased about the work that COTE is doing in the camps and pleased that we’re supporting that work through Planet Wheeler. 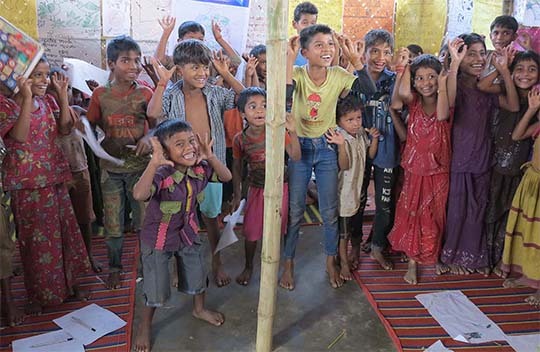 Look at these bright, energetic, cheerful (despite everything) Rohingya kids in a COTE-backed school in Kutupalong. Would you believe somebody would want to burn their homes down and chase them out of their country?